Whether you are at college or work place, communication skills are a must for building relationships as well as for helping one along the career path. Unfortunately, many students do not realise this. They make the mistake of thinking that their work can speak for itself or their nature can make an impact. But more often, you need to advertise and showcase yourself through the use of language and expressions. Communication involves all four areas- speaking, writing , listening and reading and presenting . So if you need to be a competent communicator, you need to brush up on all four of these areas. So let us look at some ways to improve and enhance communication skills. You need to develop a habit of reading as much as possible, on a regular basis. You can start from simple content and progress to more advanced content over time. The reading habit is essential for the generation of new creative ideas, for linking words and sentences together and broadens your comprehension of the language. When you read more, you automatically lay the groundwork for your speaking skills to improve. It also broadens your vocabulary. Effective communication : The only weapon against awkward silences known to man. Whether you are writing or speaking, it is always best to keep it simple and clean. Use of complicated language and jargon may render you difficult to understand. Your aim as a communicator is to ensure that your ideas make sense and appeal to the audience. So use simple, straightforward language to get to the point. Being a good communicator, is not just about being a good talker or using colourful and impressive language. It is about displaying effective listening skills. 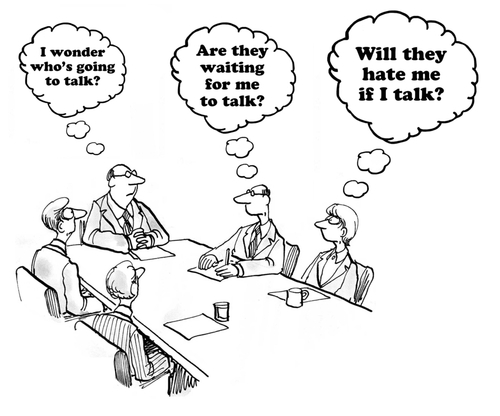 Effective listening refers to the ability to fully listen to what the other person is saying, to understand the spoken and unspoken nuances of the conversation. Show the correct listening attitude, bend your head and acknowledge that you are listening. You can repeat the statements made by the speaker to convey to him that you are interested in what he wants to say. Much of what we communicate is often through indirect communication. This means, that often it is our body language which conveys our real intention. Our words may not truly reflect what is in our minds. Hence, if you want to be a good communicator- pay attention to the body language, the gestures, the facial expressions of others and make use of effective body language where and when required. For e.g. when you are trying to resolve an irritable issue, adopt a friendly attitude. Good speaking skills are not born in a day and may need time and practice. So, if you have to give a challenging presentation you need to practice speaking at home a couple of times, with the proper tone and pace so that you can give an effective presentation at the end of the day.